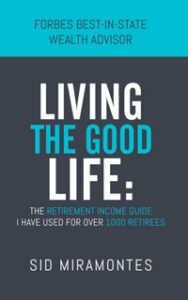 Retirement is not an end – It’s your new beginning! Over the past 23 years, I have assisted more than 1,000 retirees through their retirement journeys. Recognized as a top RIA by FA Magazine in 2016, our top priority at Miramontes Capital is to assist our clients in reaching their retirement goals and achieving their most meaningful life. The better we know a client, the better my team and I can understand their needs and desires, the better we can communicate and perform, and the more likely our clients are to achieve their retirement dreams. View our resources to learn more about retirement and what you need to do to be prepared for a promising future. Named a top California advisor by Forbes, our main goal is to give your life meaning, whether that is spending the time with your grandkids, vacationing in Europe, or visiting every ballpark in America. Our financial team is educated and specializes in retirement planning. 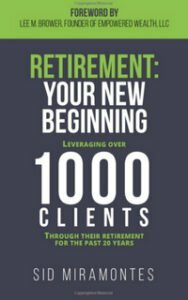 Named three times in Barron’s “Top Financial Advisors” list and one of Forbes’ top Advisors in California for 2018, we are proven and can help you live your dream retirement. With our first-class communication and client service models, we help you plan every step of the way, allowing for a smooth transition into the rest of your life. We welcome you to attend a workshop or schedule an appointment to help you start your new beginning! It’s your time to make an impact. Sid Miramontes is a native of Los Angeles, California, and has lived and worked in the Southern California region for many years. When he first entered the field of finance, Sid discovered that many large financial firms were ill-prepared to offer client-oriented services to their customers. He knew that a ripe opportunity awaited him. Fast forward 20 years and Sid is now the CEO of Miramontes Capital, an award-winning financial services firm he founded based on his own experiences and his passion for helping others. Miramontes Capital is headquartered in Newport Beach, California, and offers its clients a full selection of highly personalized financial services. By creating financial planning strategies that help clients achieve their goals, Sid and his team have become known in the industry as some of the finest professionals available. Sid’s march toward personal success began in 1995, when he sought insights into creating his own investment portfolio. After meeting with a financial planner, he learned two aspects that would shape the course of his career and his life itself. First, he learned that he had a keen interest in the financial services industry. Second, he learned that some of the most prominent financial companies used one-size-fits-all solutions to serve their clients. He knew that the industry needed a new voice and a new direction. Starting as an investment advisor with the global wealth management firm Morgan Stanley Smith Barney, Sid demonstrated his understanding of the financial world, including investment strategies, international money markets, and the dynamics that affected investment performance. His superiors noticed, quickly propelling him through the ranks over a twelve-year period until he was named the firm’s Senior Vice President in 2007. Armed with extensive knowledge in investment strategy and planning, Sid left Morgan Stanley in 2008 and took a position with UBS, the Swiss multinational financial services company. He was chosen as the firm’s Managing Director of its Wealth Management division, a perfect fit for his talents and his knowledge. As the division’s director, Sid and his team were responsible for client assets exceeding hundreds of millions of dollars. With his extensive experience in the field, he was able to help many of his clients achieve financial freedom. 2015 was a momentous year in Sid’s career. He had managed to achieve great things as a financial services expert, and knew that there was something more to offer to the clients that had come to rely on his expertise. He chose to forge his own path, founding Miramontes Capital in Irvine, California. Immediately, he and his firm were recognized for their commitment to client care. He believes that personalized service is the key to creating long-term relationships between financial advisors and their clients, and recognizes that each client will have his or her own financial goals. By addressing these unique attributes, Sid and his hand-picked team of financial professionals deliver award-winning service. The firm has been recognized by some of the most prestigious publications in the financial industry, including Barron’s and Financial Advisor (FA) Magazine. Miramontes Capital is built on core values, serving clients with trust and integrity. Each interaction begins with a detailed analysis of clients’ needs, concerns, and risk tolerance, helping the planning team prepare products and services that meet those specific needs. With his firm’s help, clients are able to create comprehensive plans for their financial futures, ensuring that retirement funds will be available for future expenses for themselves and their loved ones.